This M-48 has been in my personal collection since they were first imported over a decade ago. In all that time I have put no more than 100 rounds through it. Its in great shape, completely refinished stock with 12 coats of "Tru-Oil" and a bright shiny bore. All the goodies are included. The serial number on this sporterized Krag indicates it was manufactured in 1904. Like most rifles that are one hundred and six years old she's not a beauty queen but she can still get the job done. Bluing is fading on the barrel with a small patch of pitting just in front of the receiver as can be seen in the pictures, and there are areas of patina on the receiver. A solid, smooth action and strong rifling will make this Krag a good shooter with plenty of range or field time left to enjoy. This Long Branch rifle is in very nice shape. The metal on the hand guards by the muzzle has been refinished. Regular dings and handling wear, the bore looks clean and solid with strong rifling. 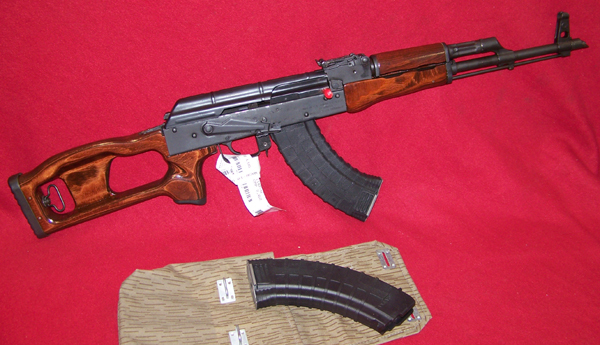 The buttstock has a number of serial or unit markings and the remnents of some paint used for some type of I.D. Dated 1945 the receiver, bolt and magazine also have matching serial numbers, the stock is a forced match. Here's another World War two beaut with plenty of life left that will be a valued addition to any collection. that their people preserve the spirit of resistance? Let them take arms." Shipping Included to the Continental U.S.A. This 110 is in great shape, it was somebody's baby or at least rarely used. Slide your scope on it and your ready to go. The action is smooth and solid, couple of small marks on bolt, the blue is near perfect and the bore is bright with strong rifling. The rubber recoil pad shows some use, however the stock has NO dings or dents and looks almost new.